Extremely rare Pro Lites from 2002 and 1998. 2 are nwt and the PL9 is nwot. These weigh in the 18-19 ounce range - insanely light for a Heart Of The Hide. 2002 PRO-MR - $179 includes shipping. 1998 PRO-PL2 - $179 includes shipping. BC i must like following you around and saying nice gloves, ill tell you here as well. I wish i had a use for myself - BUT someone has to want these bad boys. Best Rawlings patches ever IMO. These were from a find you had right? just new old dead stock? was it at a mom and pop type store? That's correct. A local sporting goods shop that I visit once a week must have found them in some back room. Unfortunately at time of purchase, the young salesman wasn't aware of the gloves age or the backstory, but I was literally shaking with excitement. i love hearing stories like that. I wish the finds thread was more active. I didnt find new old stock for gloves, but on my way from the Thousand Islands back to Buffalo I stopped at a place in Syracuse bc they had Ump stuff on hand and Google said it was the only place in the area that carried that stuff so we stopped on the way home. What greeted us upon arrival was a small store that looked like the old mens suit stores (but sports ump/ref pants and shirts) in half of the place while an off shoot had baseball equpt. 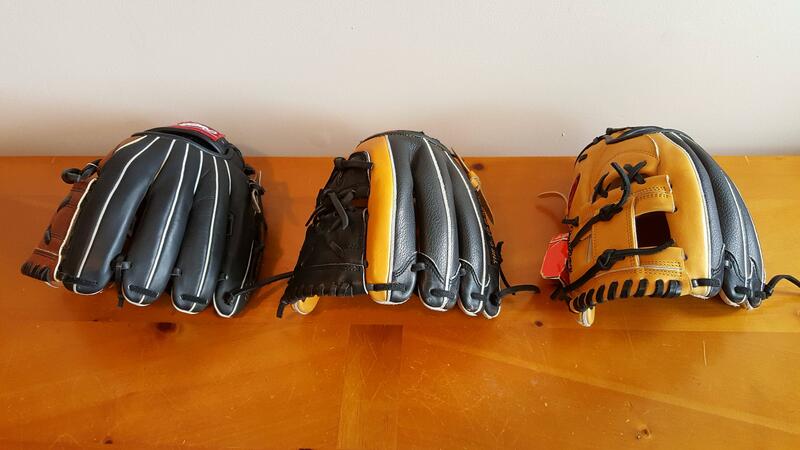 Its had a bunch of old school Easton and Cooper kids gloves with a few mixed adult softball ones as well. Sadly, no old high end Rawlings or Wilson/Mizzy BUT i did score bc i found a few (sadly no matching pairs) of those puffy Mizuno batting gloves from the early 90's for 3$ each. I should have bought more bc i brought it home and put it on ebay and it ended up going for $80 something. I know a few people on here have had old stock finds and even though there prob isnt- i like to think theres still a few mom and pop stores in the mid west or someplace off the beaten path that might still have a few usa HOH kicking around that can no longer be hung bc their hang tag came off years ago so they just blend in among the rest of the stores stock and have a layer of dust - waiting to be discovered!!!! Gloves have sold. Please delete or move to sold category thank you.